April 21 – and more fiber! I got home from the fiber festival yesterday and suddenly realized that I’d forgotten to look for a matching yarn for a special knitting project I’m going to be starting soon. So I decided I’d just drive back up to Hood River again! Why not? It’s a lovely drive and I don’t mind going alone. So off I went, about 11 a.m. I figured I’d have plenty of time to look around because the marketplace closed at 4 o’clock. Wrong, wrong, wrong. It closed at 2 o’clock! No biggie. I had two hours to look around, talk to friends and enjoy the atmosphere. I didn’t find the yarn I was looking for, but it was good to be there. I really enjoyed the afternoon. 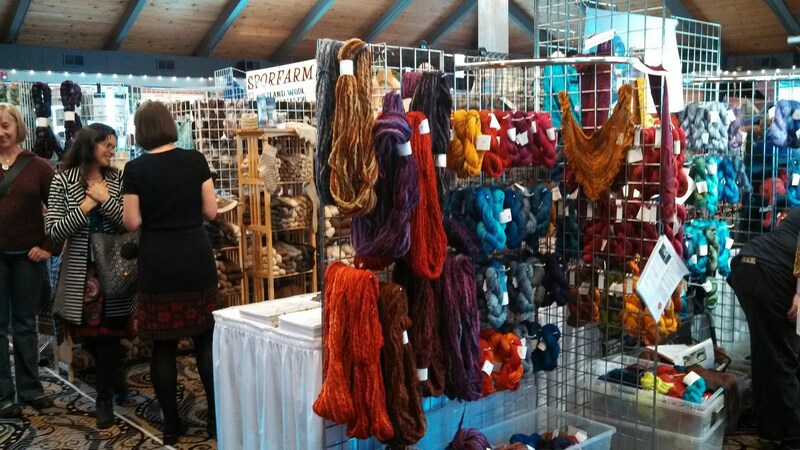 This was a fabulous fiber festival, and I am in awe that it was the idea of just one person who put last year’s first festival together. Kudos to Yvonne of Lavender Sheep for making it happen! I love going to fiber festivals. I’ve found that the people who attend them couldn’t care less about what I look like or how much I weigh, whether or not I’m wearing makeup, or what kind of clothes I wear. That stuff just isn’t important. I never feel as though I have to dress up or impress anyone; we’re all connected because of our love of fiber. Kinda like being among all my friends and ‘ohana from da ‘aina. The outside stuff just doesn’t matter; what’s important is what’s on the inside. But I digress. Here’s today’s photo, full of fibery goodness. It was a terrific weekend! This entry was posted in 365 Days, Handspinning. Bookmark the permalink.